Sauna from Finland in co-operation with Slush to increase international interest towards the Finnish sauna. Sun goes down quickly. Lights of the convention center wipe the surface of a wooden wall. Steam arises slowly. Fire crackles in the fireplace, benches creak a bit. Scoop of water swings, and the stones hiss when water hits them. Laptops and cellphones wait in the lockers of the dressing rooms. Only the heat, peace and genuine encounters between the sauna bathers remain. In December, during the darkest season in Finland, 20 000 entrepreneurs, investors, technology professionals, and media representants all over the world get together in the Expo and Convention Center in Helsinki. In ten year Slush has grown from a local event for 300 people to a world’s leading start-up event. This year Slush is organized in Helsinki for the 11th time on 4.-5.12. In addition the event also takes place in Shanghai, Tokyo and Singapore. Last fall Sauna from Finland took part in building Slush Sauna Village, which was then organized for the first time. Slush visitors got to enjoy soft steams of saunas and relax in the warmth of heated tubs. Almost 600 sauna bathers visited the village during a couple of days, and the concept raised a lot of interest. This year Sauna from Finland joins Slush again in the building of Sauna Village. This time the village will be bigger: the goal is to have 10 different saunas and multiple tubs, which will serve 1000 sauna bathers during the event. Sauna Village will also include Sauna Lounge, where the bathers get to enjoy snacks and refreshments. Trained Sauna Hosts will take care of the bathers. Executive Manager of Sauna from Finland Carita Harju is excited about the co-operation. – This is an essential opportunity to enhance the image of the Finnish sauna as a place that supports wellbeing. In Sauna Village one can relax and take a break from the hectic world, but also make interesting openings regarding the business. This is an important partnership for us and remarkable chance for our network. Sauna Village adds Slush an unique and authentic Finnish touch. The visitors get to experience two worlds: lasers and technology inside the convention centre, and natural materials and atmospheric lanterns in the village. – Sauna has been an important aspect of Slush since the beginning. Last year we built the village with a really tight schedule, and it was said to be the best thing that has happened to Slush. In spite of the great reception by the audience, much was left to be improved. Learning from this we strive to make Sauna Village even better, a memorable Slush experience, says Slush Producer Anssi Laurila. 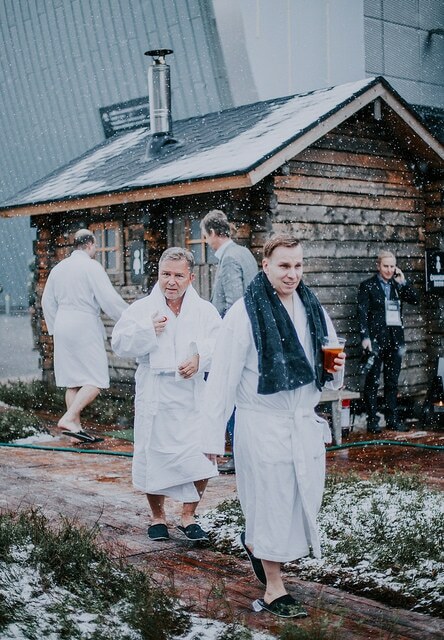 We’re currently looking for partners for Slush Sauna Village! Contact us if you wish to take part in a memorable entirety that reaches a massive amount of domestic and international audience.